If you are reading this article, it’s very likely you had noticed hiberfil.sys (Hibernation file) in your PC. It locates on your system drive, usually C drive. It catches your eye because it takes up large disk space, for mine, it’s about 3 GB. That depends on the amount of memory installed in your PC. The hibernation file exists in your PC only when you enable sleep or hibernate mode. When your computer is enabled sleep or hibernate mode, Windows writes all the information in the memory on your hiberfil.sys. This enables your computer wake up much quicker from hibernation than from full-off state. Can I delete it ? Since it usually takes a not-less disk space, you may want to know if you can delete it to free up space. Actually, when you disable the hibernation feature, the file would be deleted automatically. See how to turn off hibernation on Windows. Type cmd in the search box from the Start menu. 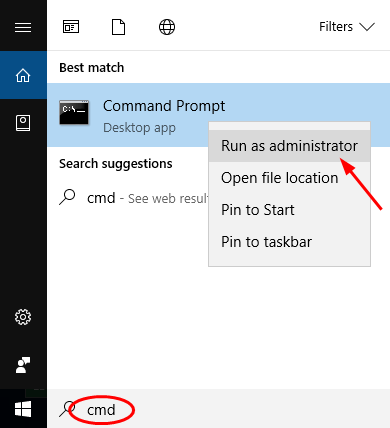 Then right-click on Command Prompt from the top result and choose Run as administrator. On the open black window, type powerfg -h off and press Enter to run it. The hibernation would be turned off immediately. Back to your File Explorer, you will find there’s no hibernation file there. 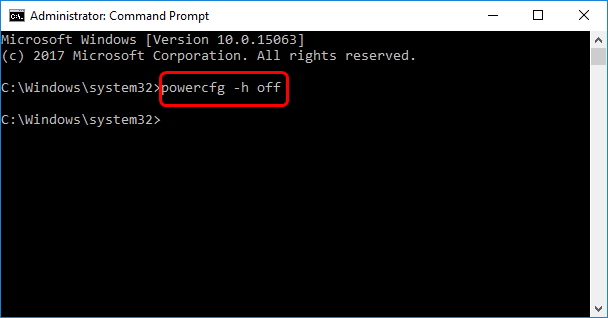 If someday you want to use hibernation feature again, you can run this command: powercfg -h on in the command prompt window. Then the hibernate mode would be available.